I use a 60 qt Igloo cube. The temperature does not drop a degree over the course of an hour. I hit about 70% efficiency while batch sparging. I did a 10 gallon batch of SN Celebration IPA in November with no issues. I believe the OG was 1.067. I made a copper grid of 1/2" piping with perpendicular slits cut about every inch on the bottom. I lucked out because the same weldless ball valve that I use on my kettle works perfectly, so I bought a second one. Oh...and it's blue! Am I missing something here? a 48-qt is a 12 gallon cooler. How is that a bottleneck for really big beers? I was able to get a 'big beer' in a 5 gallon cooler, but it was very iffy because I couldn't stir if it got stuck early. I've since moved on to a 52-qt and can easily mash 30-32 pounds of grain. 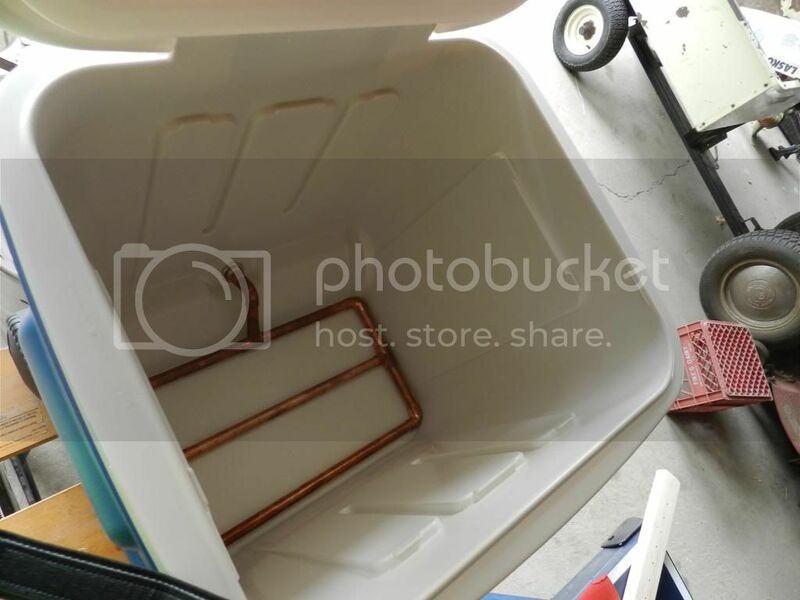 10gallon igloo with my homemade copper manifold. Leaves next to nothing in the cooler, never stuck sparge, and can run it as fast as I feel like. Am I missing something here? 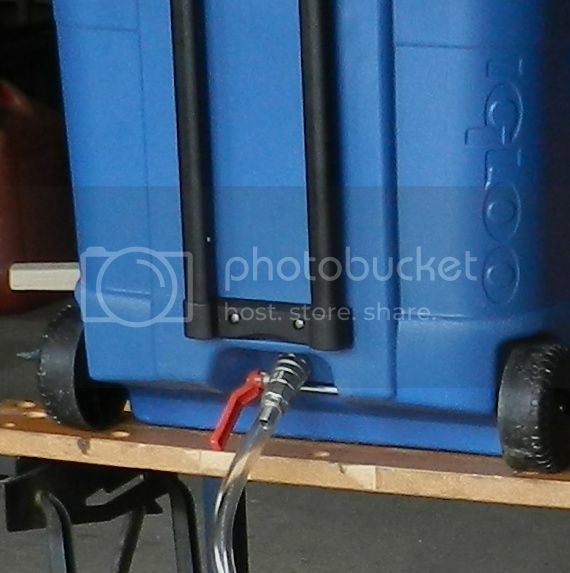 a 48-qt is a 12 gallon cooler. How is that a bottleneck for really big beers? Assuming you mash at 1.2 qt/lb and leave a little room to stir, you can fit roughly 27 lb of grain in 12 gal. Advertised cooler volumes usually include the lid, but let's stick with 27 lb. At 36 point-gal/lb and 65% efficiency, that's 5.5 gal of 1.122 wort. That's a BIG beer, but is it "really big"? Very nice set up. Obviously it is very close to my set up that I posted above. Do you have issues getting the inside of your copper clean of debris with it all soldered together. I take mine apart after every mash to wash and can be a pain to put back together. I was just wondering what you do, because I may certainly consider soldering mine. May be hard to see, but if you look in the middle at the T's, it's not soldered there, allowing you to pull apart into three sections. Rinsing is a snap that way and I rinse after each mash. Got it! This is a very solid design....I too pull just about all the wort through. There is minimal, if any, dead space with this design and would recommend it for anybody.